Glued together body parts before primer. This is test fit mock up. Loos nice to me. Can hardly wait to see it in gloss black with gold decals on it. Next is putty job. Yet another kit started. I am breaking my own artificial rules limiting number of kits I build in parallel. But with my elbow injured, I cannot really work on any of the other builds. That's my excuse anyway. Starting with my usual removal of parts from plastic trees, clean up and preparation work. Will do some test fit assemblies along the way as well. 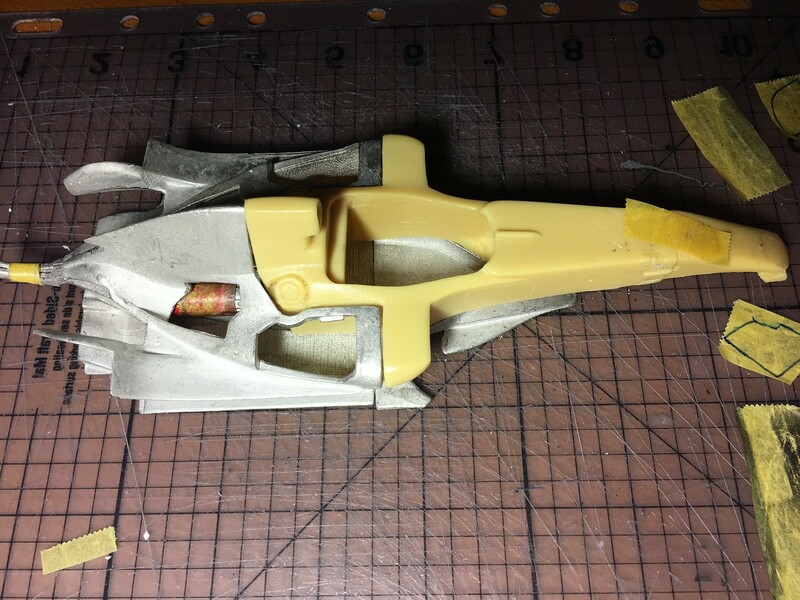 Quite a few parts in this kit have to be pre-assembled and prepared before primer can go on. 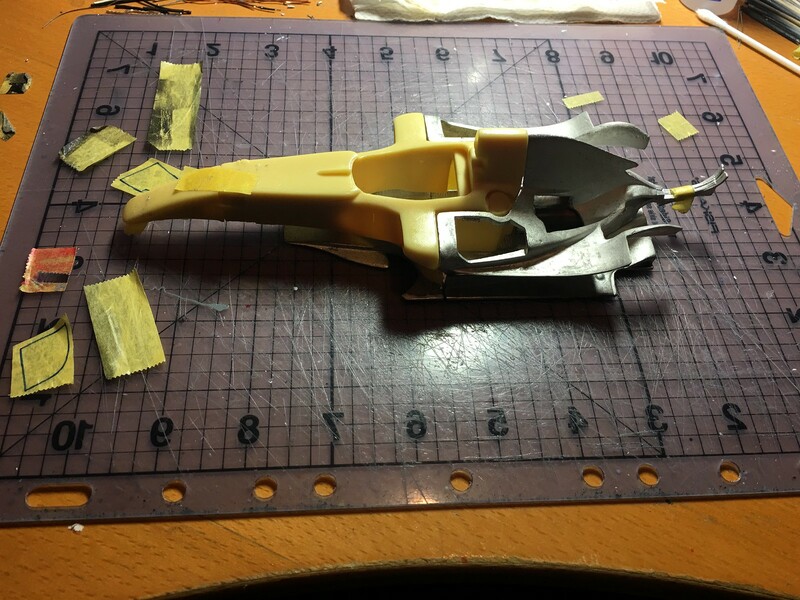 There are many body parts for example, that I want pre-assemble and putty seems before paint. Just a pile of parts at present. 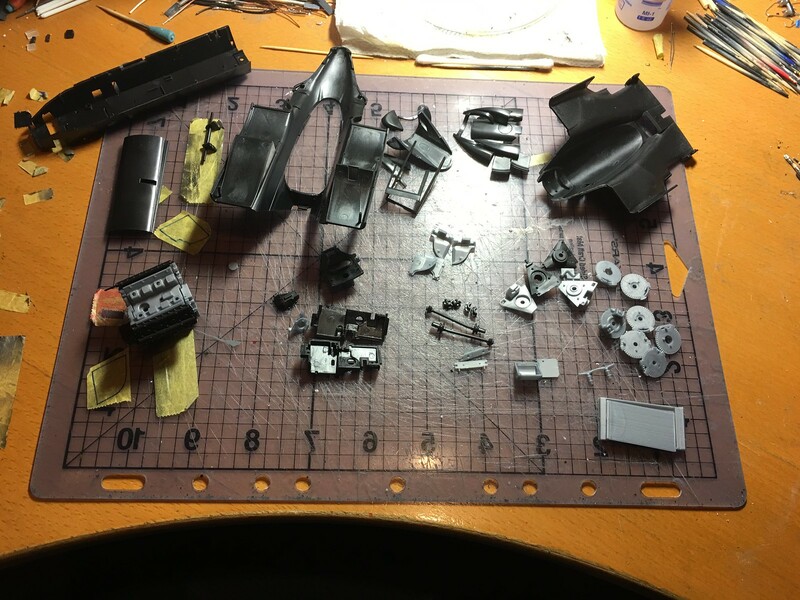 And here some sub-assemblies are done. 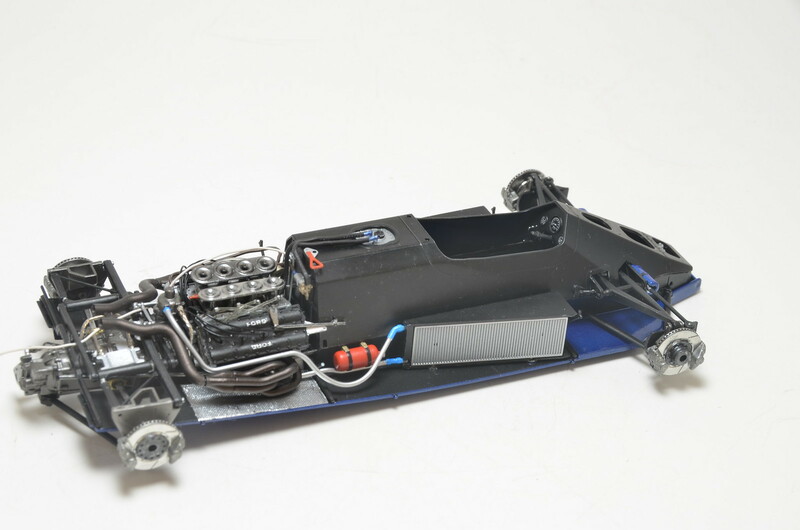 Completed chassis pretty much. I have used fishing lead lines to simulate oil cooling hoses. In addition to that I've added some connections for the fuel distribution system: from tank to pump and return line from distributor to tank. Used metal wire wrapped with shrink tubes. 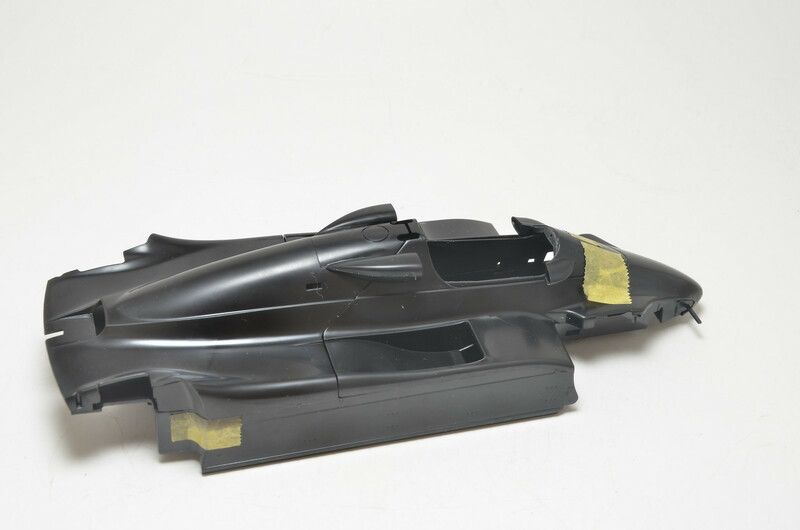 Also added couple of breather lines: from fuel tank and from radiator pipes. Installed fire extinguisher. 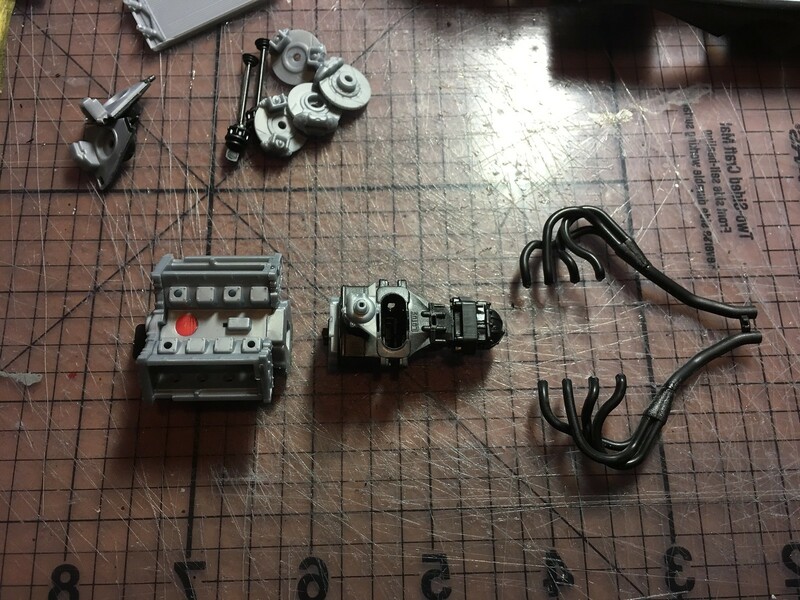 Added throttle linkage later as well. 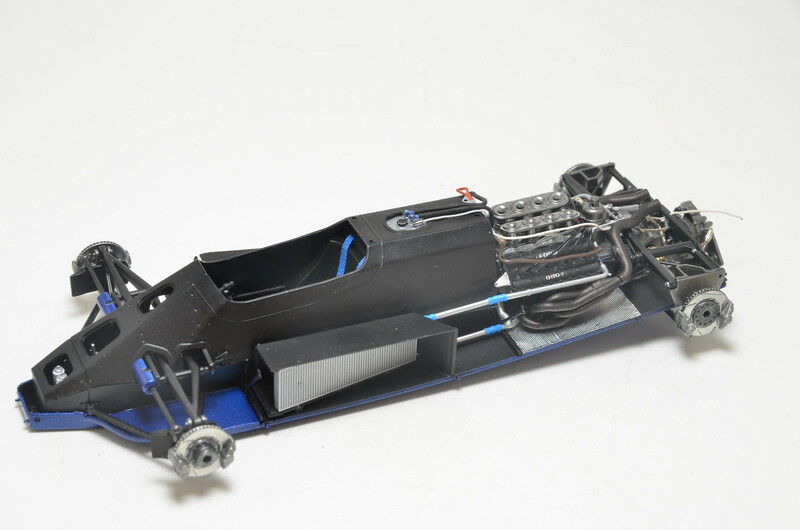 After all that I was able to mate engine/gearbox assembly to monocoque and then attach complete chassis to floor. Next, radiators and pipes were installed. Everything was going ok, before I've attached chassis to floor. Floor in my kit apparently was warped a bit clockwise at the rear and not straight horizontally. Not sure how much of that was factory defect and how much I might have contributed with my painting process. In the end, rear suspension ended up uneven, with left side about 1mm higher. There is a big chance model will end up standing on three wheels :( What a let down. Here is how model currently looks. 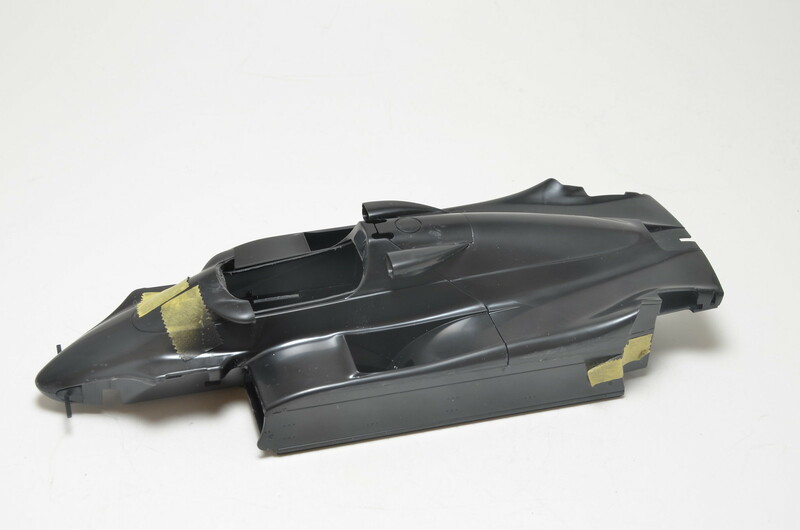 Finishing of body panels is the next target. Need to apply decals and clear coat over them. Always wanted to build a model of this car. Got cheaper copy lately from f1m member. Have no excuses not to start it. Fit is pretty bad. Spent 3 hours adjusting parts last night. Lots more work needed. But mixing up metal and resin parts should hopefully help me produce better result. Main reason I often like metal parts over resin ones is that they could be adjusted/re-shaped. If all parts were done in resin, it would have been much more difficult to get them fit together. Quick shots of current state.